On my seemingly mountainous, yet steadily disintegrating, pile of Really Important Physics Things That I Never Learned in Undergrad (TM) was the importance of choosing a system when analyzing multiple objects in an interaction. Physics is, among other things, a study of how things interact, but when your analysis is only focused on one object, then deliberately choosing a system seems unnecessary. A rope pulling a crate is certainly “multiple objects interacting”, however in problems such as this, nobody actually cares about the rope. For much of the traditional kinematics/dynamics sequence, the choice of a system is largely invisible and often a single object. The car. The crate. The ball. But this becomes a problem when anything involving a conservation law comes into play. Whether or not some quantity is conserved is completely dependent upon the chosen system. Upon reflection, I imagine the unspoken, implicit choice of “system” becomes something murky like “all the objects mentioned in the problem” or even “the entire universe.” I also suspect that not explicitly defining a system causes issues with students applying conservation laws [citation to be added later, possibly?]. If students internalize “energy conservation” as “energy doesn’t change”, then I can see that causing issues with incorporating work/change in energy into their problem solving process. Same goes with the impulse-momentum theorem and momentum. This new appreciation for the explicit choice of a system started with a twitter conversation earlier this year in which I expressed my dislike of the phrase “closed system.” Yet until recently, I wasn’t sure how to help my students develop the same appreciation and understanding of what it means to define a system in relation to conservation laws. Until now. I think. Afterwards, they worked on using momentum bar charts to represent the experiment. I doctored the numbers a little to keep the focus on the concept of thinking proportionally while not being overshadowed by seemingly random decimals and fractions. I asked them to determine the initial (as defined before the carts exploded) total momentum and the final total momentum (as defined as after the carts stopped touching), to which their surprise was zero. Peculiar! To be perfectly honest, I wasn’t planning what came next until the night before I did it, which is when I remembered the twitter conversation from earlier this year. As it turns out, asking students to sum up the momenta of the carts came in handy later on. My general strategy for students discovering foundational laws and principles is to provide them both with an experiment and a way to view the results in such a way that whatever it is I’m wanting them to discover screams at them with a megaphone “HEY! LISTEN! HEY!” until they can’t stand it anymore. In this case, I’m wanting them to discover the Law of Conservation of Momentum while simultaneously approaching the Impulse-Momentum Theorem. 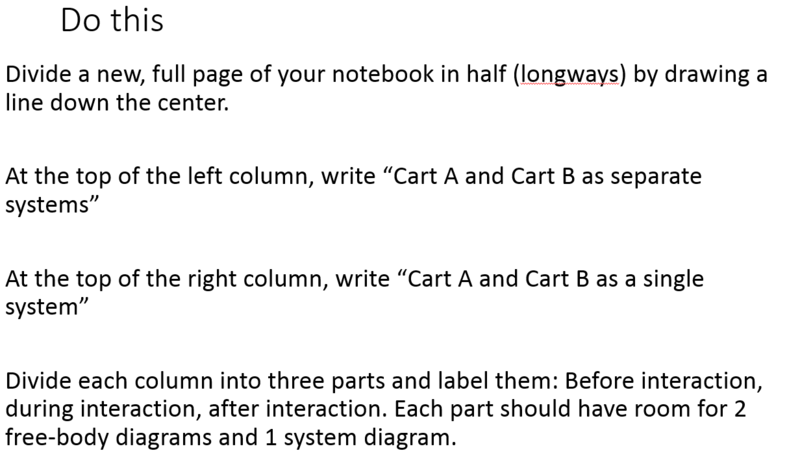 Students were prompted at the beginning of the class to organize their notebooks into two columns with three rows each. I started with analyzing the carts separately because that’s what they’re used to. We’d not formally discussed how to analyze a collection of objects, much less that such a thing was “allowed.” I allowed students to work primarily in their groups without assistance from me, and they required little help as all of the diagrams and analysis was nothing new to them. Once I was certain that all the groups had gotten everything, I put my analysis on the whiteboard. 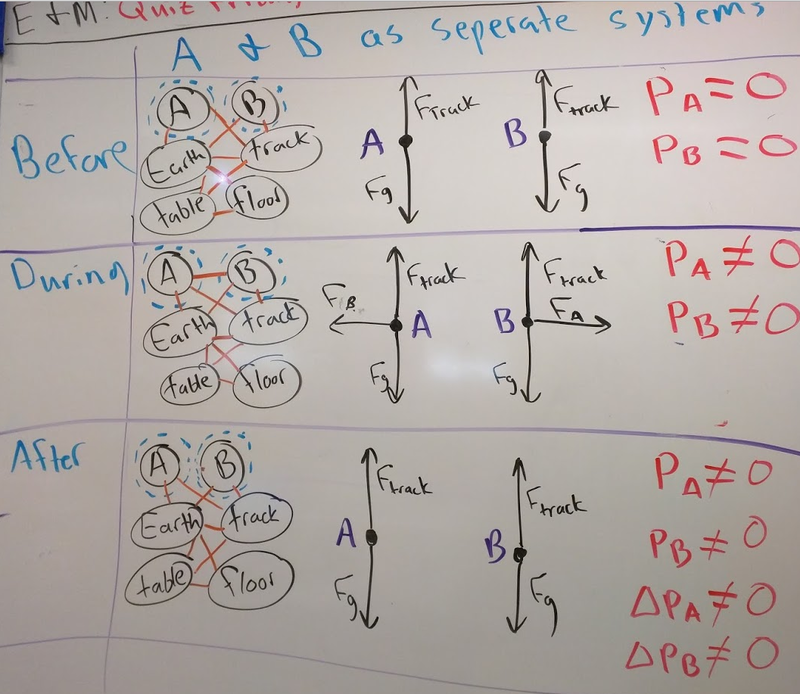 The diagrams with all the circles on the left are system schemas, which were introduced months before when students were first learning how to draw free-body diagrams. 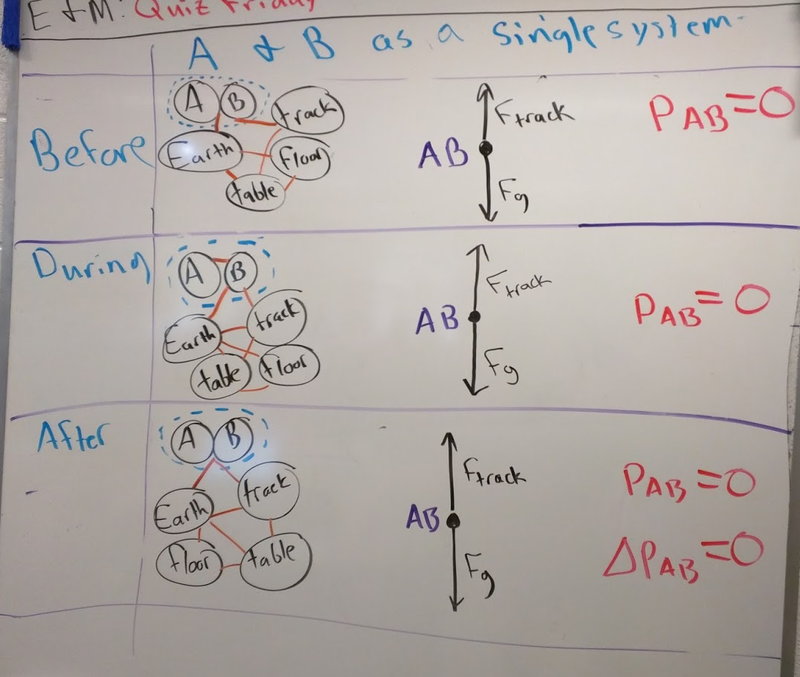 Emphasis was placed on determining whether the momentum of each “system” (i.e., cart) was equal or not equal to zero, along with the final change in momentum from before, to during, to after. 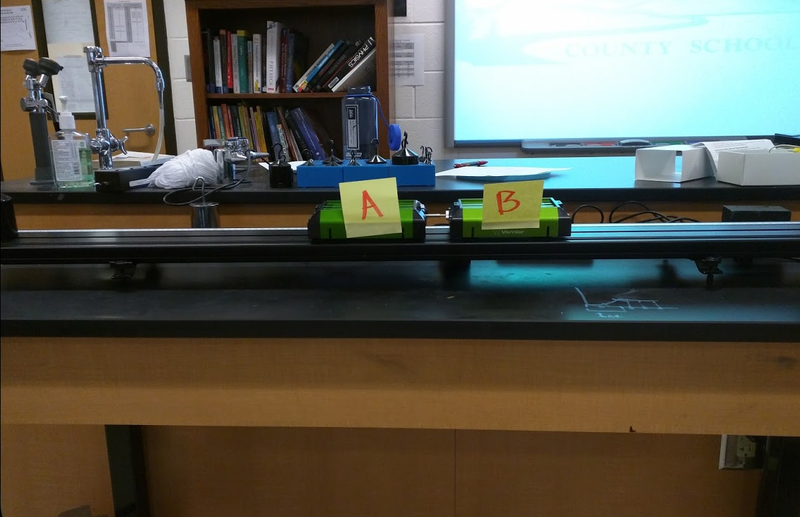 Next up was for students to re-do the analysis, but treating both carts as a single system. 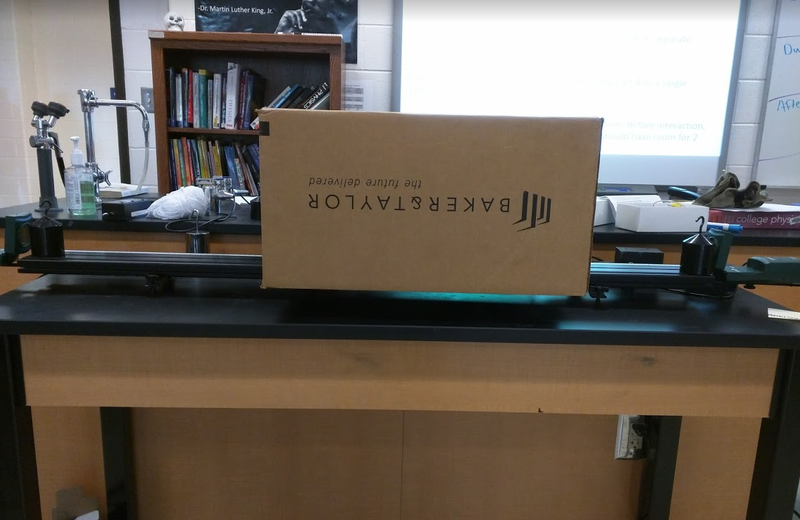 What I was most worried about was the level of abstraction required for students to truly understand what it meant to analyze both carts as a single system. We hadn’t discussed center-of-mass, nor had we discussed what it would mean for the center of mass of an object or collection of objects to be located outside of those objects. While center-of-mass would be the most accurate way to articulate the effects due to conservation of momentum, it would require more new concepts and abstraction, which I was sure to be too much for my students to assimilate at once. Instead, I placed a box over both carts. I emphasized that this sort of analysis is something that we’d done many times before. The carts themselves are made of individual atoms all interacting with each other, yet we never worried about it because it was unnecessary. Treating the carts as a “single” object was really no different, and the visual of the box really seemed to drive the point home. During the times in which students were moving through each of the before, during, and after steps, I would raise the box, set the carts accordingly, and put it back down. I emphasized that we were only concerned with what happened to the box from the outside. Just like we didn’t care what individual atoms were doing before, we don’t really care about what happens inside the box. Without much help from me, students produced the following analysis in their notebooks. Again, emphasis is placed on determining the total change in momentum from before, during, to after the interaction. If the forces on a system are balanced, then it’s momentum doesn’t change. If the forces are unbalanced, then it’s momentum does change. In a closed system, the momentum of that system doesn’t change. I’m with Frank; ditch the phrasing of “open” and “closed” system all together. @DeltaGPhys @TRegPhysics @LCTTA So then why bother calling systems open, closed, etc? Just say no net F, no net W, and/or no net T? There’s no reason to wait until momentum to introduce the idea of analyzing systems of single and multiple objects. Next year, I certainly won’t wait so long. I imagine the same type of demonstration can be performed and analyzed to get the point across. This will be particularly useful once we get into energy, where the entire concepts of work and power are defined by what’s happening by or on the system and, of course, the link between the system definition and the law of conservation of energy. This has also helped me realize something about the kind of physics teacher that I am. I am continually fascinated by all the connections I’m discovering that I never found on the first, second, or third time around with all of this content. Now, more than ever, I see physics as an intricately constructed puzzle-that’s-also-a-tower, built from the ground up from a few simple principles and definitions. I want to help my students construct this tower for themselves and see all the beauty in the details that I do. More practically, I think that students being aware of these details helps them achieve a more deep understanding of physics. This entry was posted in Uncategorized and tagged lesson plans, modeling, momentum. Bookmark the permalink.